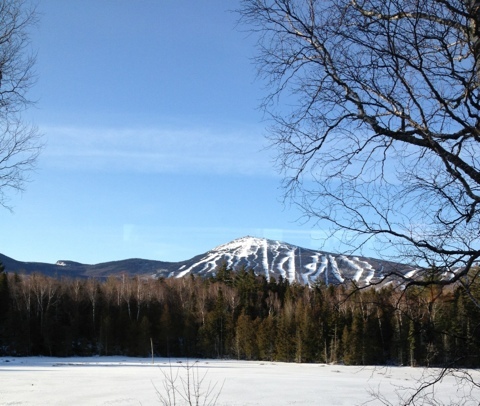 It was still winter for a little while longer at the Sugarloaf Marathon in Maine on Saturday. Overnight, temperatures had dipped below freezing, meaning the track had frozen up nicely and would be fast for at least the first half of the race. My warm-up wasn’t promising. I still felt out of sorts from the virus I had been dealing with for the past three weeks. I had barely done any training since Bretton Woods and hadn’t been on snow since then. My heart rate didn’t look good. The oatmeal from breakfast brimmed at the base of my esophagus. The nordic season is not yet complete (yes, I will be doing the Sugarloaf Marathon) but I’ve already signed up for a running race. I love the B.A.A. races. Premium organization — and entry fees — but always a good experience. Since I’ve run through the winter, the thought of doing a 5k isn’t unreasonable, though doing one at race pace might be asking for trouble. Sometimes discipline is about restraint, but I’m not very good at slowing down. The Bretton Woods Nordic Marathon is a sign of the ski season winding down. It has historically marked the final weekend of my ski season. As I lined up for the start, it was feeling like a long season, too, with my tank pretty empty after being sick all week with a virus that had gotten into my lungs, joints and muscles. The race was comprised of two, 21km laps containing long double-sections, some grinding uphills and a couple of steep sections. With fresh snow on top of ice in many sections on the lower half of the course and wet powder conditions in the higher elevations, the wax of the day was a cocktail of klister and stick. I followed the Swix recommendation and went with KR35 covered with VR45. I think it would have worked out pretty well for me if I had been able to put it on my skis with any finesse. Instead, the kick-zones looked like a double-glazed Krispy-Kreme,and like said donuts, the mistake would repeat like a bad burp throughout the race. The Tuesday Night Race Series wrapped up with nine official races. I did eight of them. I won one of them. I finished second overall. The prizes this year were beer and chocolate. My favorite prizes over the years are the ones you can eat or drink.